The first day of your cruise has finally arrived! It seems like you have been planning this trip for quite sometime, and if you are like us, you probably have! Now that it is embarkation day, you are fully prepared to make the most of your vacation. To help, we have come up with our Top Ten Things to Do on a Cruise on Embarkation Day. Being prepared for the first day of you trip will help ensure smooth sailing for the days, and nights, ahead. Bon Voyage! 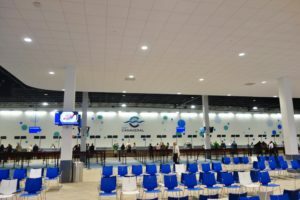 Get to the pier early– Embarkation begins before the cruise line lets on, so getting to the pier early is a great way to start your vacation with few lines. You will breeze through the check-in areas, and you can ask all the questions you want of the cruise staff without holding up the line! We always aim to get to the cruise terminal mid-morning. That way, we are among the first individuals on the ship. Don’t bring any prohibited items – Your cruise line will have a list of items you can not bring onboard. Along with typical contraband (e.g., firearms, illegal substances) review what is not allowed on your cruise. Irons and hotplates are two common items on the not-allowed list. Please, don’t try to slip something by security because they will find it. Be sure to check your cruise line’s website right before you depart as cruise lines are constantly changing allowances for things like alcohol, bottled water, etc. Have your camera ready – One of the best times to take pictures is embarkation day as many venues are empty. Get those professional looking photos completed early so you can relax and enjoy your vacation. If the weather is good, go straight to the top decks, this might be your only chance to get pictures with no one in the pool. Of course, taking lots of pictures is one of our favorite things to do on the first day of any cruise. 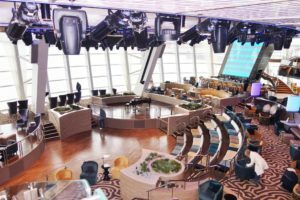 Explore the ship – If you’re as vigilant as we are, then you have probably read tons of reader reviews, studied the deck plans, and know everything about the ship and your itinerary. Still, there is much you can discover once you step foot on the ship. Embarkation day is the perfect time to start the journey. Explore all of the nooks and crannies of the vessel throughout your voyage! Wait to head to your cabin– Most ships’ cabins are not ready until a few hours before departure. The staff is busy cleaning and preparing the room for you. Normally, this means those hallways and passages are closed off to travelers. Once onboard, enjoy all of the open venues while you wait for your cabin to be ready- you have the rest of your trip to see the inside of your stateroom. Bring a well stocked carry on– A bath suiting, change of clothes, and a few vacation staples should be in your carry on so you can get your vacation started the moment you walk on the ship! Yes, you will see your luggage again, but it won’t be for a while. Make sure you have the essentials you need for an afternoon of fun in the sun. Wait to eat at the buffet, or skip it completely – Many cruise ships offer a variety of dining options on embarkation day besides the buffet. Even if your ship does not have any other options for lunch, wait a little while before trying to grab a bite to eat. In our experiences, the crowds tend to be quieter during late lunch as other travelers head to their staterooms. 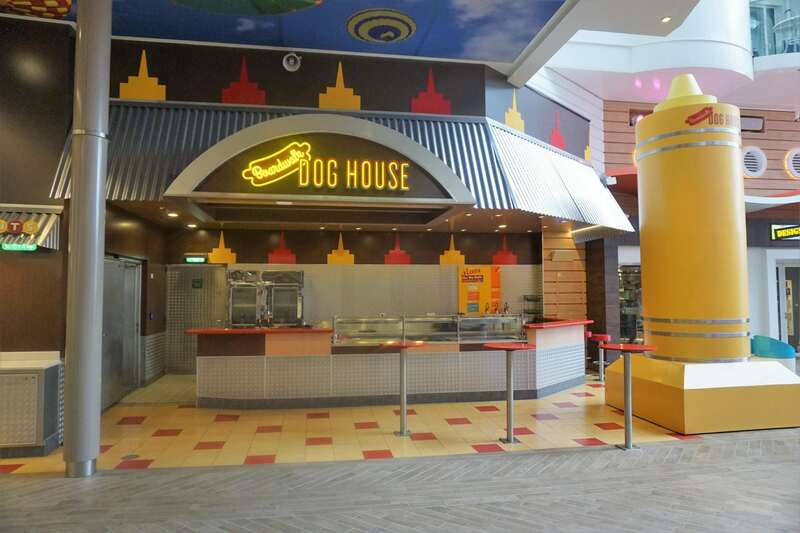 Eating at an off time is one of the smart things we do on every embarkation day. Make any outstanding reservations or appointments – If you have not already pre-booked things like specialty dining, shore excursions, or entertainment (if need be) then today is the day to get that done. Spots are sure to be limited, and you do not want to miss out on any of the amazing cruise events because you did not reserve it when you had the chance. Get to the appropriate service desk as soon as it opens to make those final arrangements. 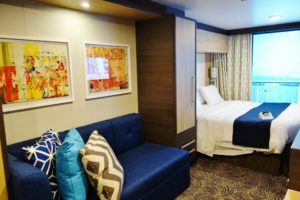 Meet your stateroom attendant – Your stateroom attendant will be taking care of you all week, so getting to know him/her will be helpful, especially if you have any special requests. On the first day, he/she will try to track you down, so take a few minutes to have a conversation. This can go a long way and might lead to some special treatment which will really enhance your vacation. Pace yourself and don’t go overboard – The excitement of the first day can be overwhelming. Even after all our cruises, we still get pumped when embarking on a new ship. But, you have the entire vacation to do and see everything, so pace yourself. Don’t try to get it all done on the first day because you will burn yourself out. Spread out the fun and excitement. You have several more days of your vacation to enjoy everything else onboard and ashore. There you have it, our Top Ten Things to Do on a Cruise on Embarkation Day. Now, all you need to do is figure out what you are going to do on the remaining days of the cruise…any enjoy every minute of your vacation! 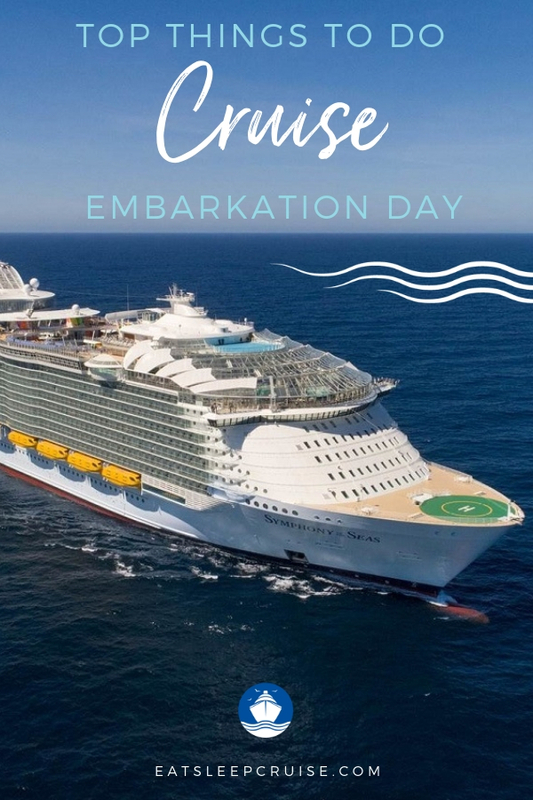 What are your embarkation day must dos? Are we missing anything in our Top Ten Things to do on a Cruise on Embarkation Day? Drop us an anchor below to let us know your embarkation day habits to help your fellow cruisers make the most of their cruise vacations! Embarkation day is my favorite day. It means that cruise you have been looking forward to for a long time is finally here! So true Matt! Thanks for the comment and taking time to read our blog! We love embarkation day too, but also Day 2, Day 3, Day 4….I could go on. The worse day of a typical cruise is Day 8, the day you depart the ship! 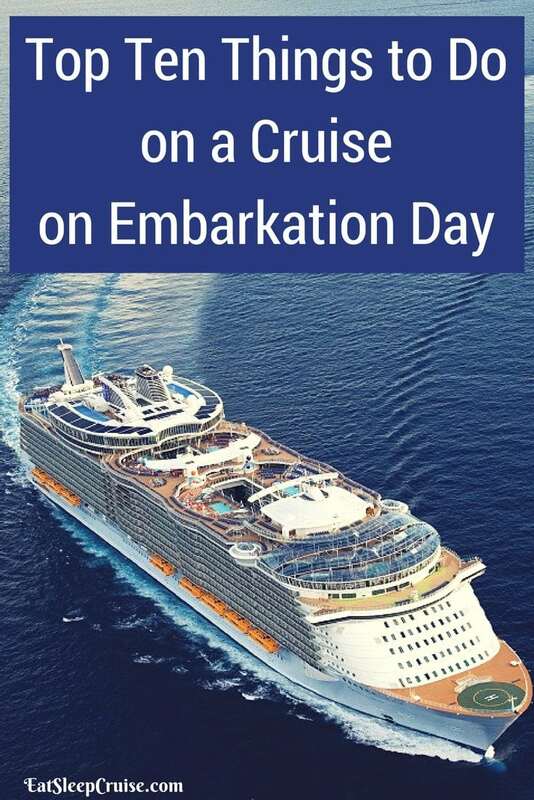 Oh yes, embarkation day is definitely the most exciting day. Discovering the ship you’ve never been on before is always the privilege of the first day. Could not agree more Cmanic. We love the first day of a cruise. Thanks for the comment. Happy sailing! Your tip on bringing a well stocked carry on bag for embarkation day is perfect! The last thing you want to do is to watch everybody else going swimming in the amazing pools while you can’t because you didn’t bring a bathing suit! Appreciate the comment Ashley. Bring a few items in your carry is a great way to beat the crowds and make the most of your first day on a ship. Sometimes your luggage does not arrive until later in the day, so why be stuck! Thanks again for reading. Happy cruising. First time cruise in December. Question, do you have to drag your carry on around for most of the day then? Hi Anne, Yes, first time cruiser! 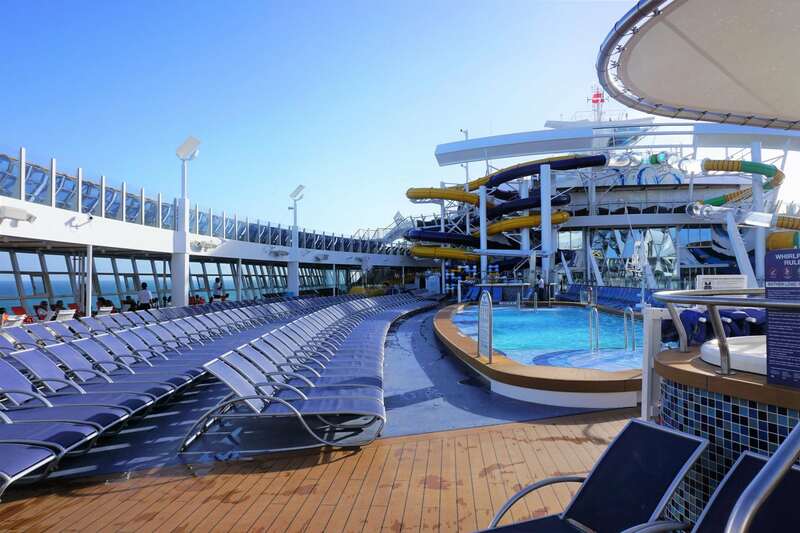 Welcome to the awesome world of cruising. Great question. It depends when you board the ship. If you get there early, as we suggestion, your cabin will not be ready. They are usually ready around 1pm to 2pm. Which means you would have to roll your carry-on for a few hours before you can drop it off in your room. If you have any other questions, don’t hesitate to ask. Which ship are you sailing on in December? We will be on the Norwegian Escape. So excited! 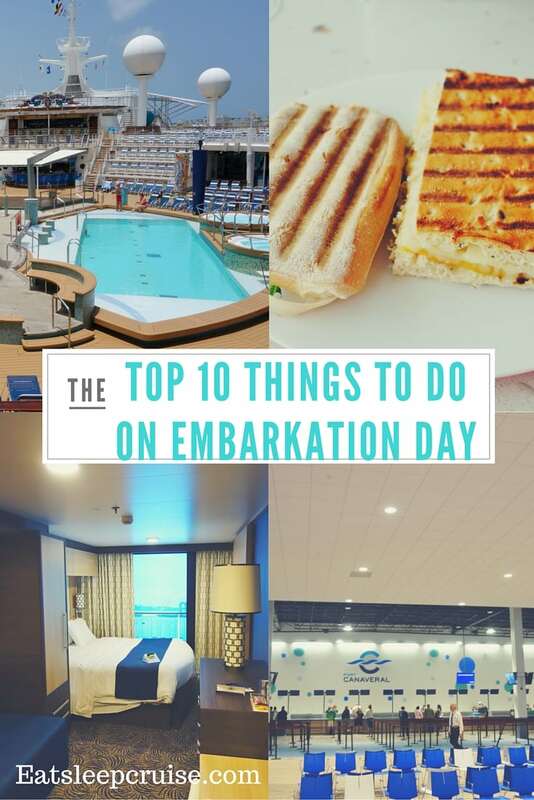 My recommendations on embarkation day is to schedule your spa visits! If you have kids aboard with you check out the kids club. Thanks Dhilton for the suggestions, we completely agree. Often you can take advantage of spa deals if you book early in the cruise. Yes, checking your kids into the kid’s club is also a must on embarkation day. Appreciate the additions to the list. Happy cruising. Great tips! Those are all the things we do the first day onboard too! Hi Ashley, thanks for the comment. Glad you found these tips useful. 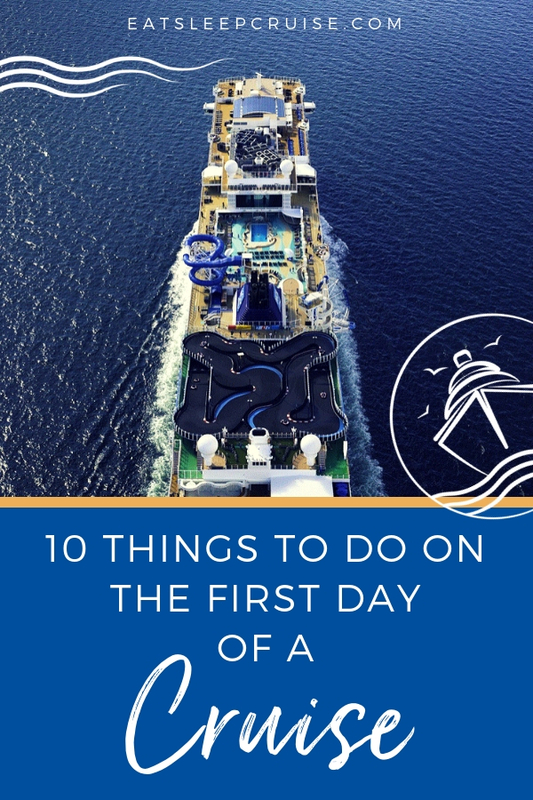 The first day of a cruise is vital to starting your vacation off on the right foot. Thanks for reading and sharing. When is your next cruise? Your tip #6 is definitely one that I always share with friends – – I typically embark from warm-weather ports so I board as early as possible and, sun worshiper that I am, I head straight for a comfy deck chair (usually a level or two above the main pool deck) and start my sun-soaked vacay immediately. I usually wear a bathing suit under a sundress so I can slip off the dress on deck and waste not a minute. My tote contains a bathing suit cover-up, hat, sunscreen … everything I like to have at hand while spending a day sunning. And I do carry anything I would need to prepare for dinner just in case my bags are delayed – casual outfit, toiletries. Why waste a single minute of fun in the sun? … Again, I’m a sun worshiper, so others may be much more inclined to explore the ship, sit down for lunch, etc. … to each his own … make your cruise your own! Thanks Stacey for reading and the comment. We love the sun too, but not as much as you!! Glad you prepare for the first day, it really sets the tone for the entire trip. When is your next cruise? We are taking our first cruise in December and I am taking notes from all you veterans on how to make it the best! Any links to how to make other days just as great please let me know! Hi Brittany, sorry for not getting back to you sooner. What ship will you be on next month? We have some suggestions that are ship specific. But, in general, check out the daily activity magazine left in your room each night and always get to events 15-30 minutes early to make sure you have a spot. Have a great cruise! Hi, my teenage girls and I are going on our first cruise this coming January, it’s surprise Christmas present!! Thank you for the tips – do we need to take our own beach towel? Hi Michele, What a great gift! Thanks for reading and the question. You do not need to pack any towels. Your cruise ship will have plenty for you to use while onboard, and will let you take them ashore. Just remember to return them when you are done or you will pay $25 a towel (or more on some lines). What cruise ship will you be sailing on in January? Thank you so much for the advice, that will definitely save some luggage space. We are travelling P&O out of Sydney – so exciting!! Hi Pascal, thanks for reading and the question. Of all vacations options out there, cruising is one of the best for solo travelers. Some cruise lines are better than others. Norwegian Cruise Lines has several ships with solo cabins that give single travelers the opportunity to meet other similiar travelers. Cruisers are very social people and you quickly make friends when onboard. Let us know if you have any other questions. I love a sit down lunch on day of embarkment. I do not like running with the crowd up to the buffet. A nice relaxing lunch is best for me. We so agree with you Judith. Thanks for the comment. When is the next cruise? Never been on a cold weather cruise…sailing on the Royal Princess October 26 from Quebec City for two weeks! Do women still wear dresses? How do u pack for this? My husband and I are taking his first cruise ever and only my second cruise. We are going to the South Pacific in April 2020 to celebrate my 50th birthday. Our cruise does not leave until 8 PM. We are flying in the day before how early is too early to arrive at the ship? We are sailing out of Auckland, New Zealand.